Antti Knutas · Software engineering researcher. Civic technology, or the diverse ways in which people are using technology to influence change in society, is a field growing across the world. While civic technology can apply low tech solutions to a great benefit, several major civic tech projects create software. Most commonly built by institutions, such as NGOs and the academia, there are an increasing number of bottom-up efforts by to create grassroots software. In this case study, we present one grassroots-based group and their software development process, and the lessons learned for future practitioners. An open access version of the paper is available in arXiv. Civic grassroots have proven their ability to create useful and scalable software that addresses pressing social needs. Although software engineering plays a fundamental role in the process of creating civic technology, academic literature that analyses the software development processes of civic tech grassroots is scarce. This paper aims to advance the understanding of how civic grassroots tackle the different activities in their software development processes. 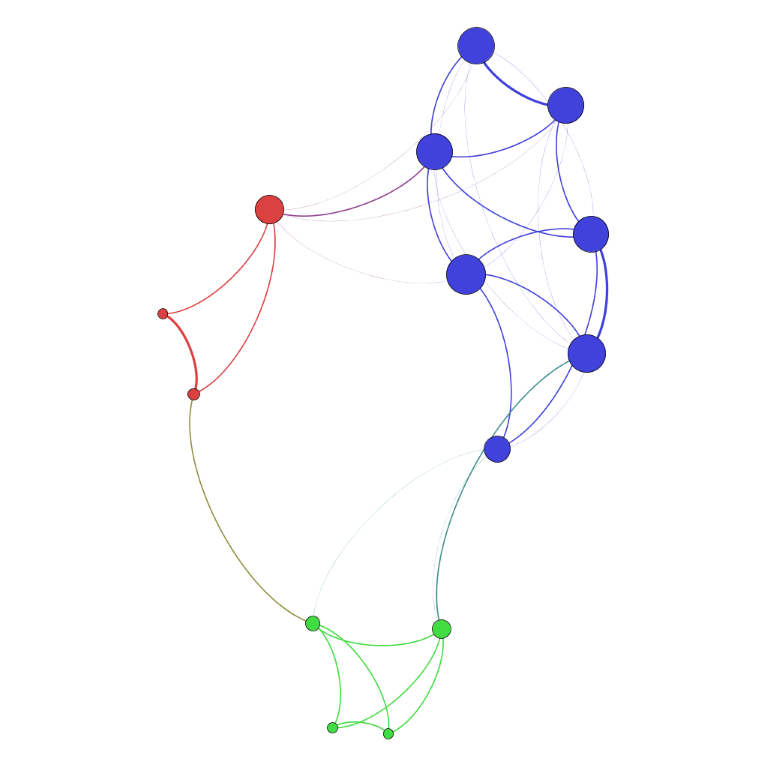 In this study, we followed the formation of two projects in a civic tech group (Code for Ireland) seeking to understand how their development processes evolved over time, and how the group carried out their work in creating new technology. 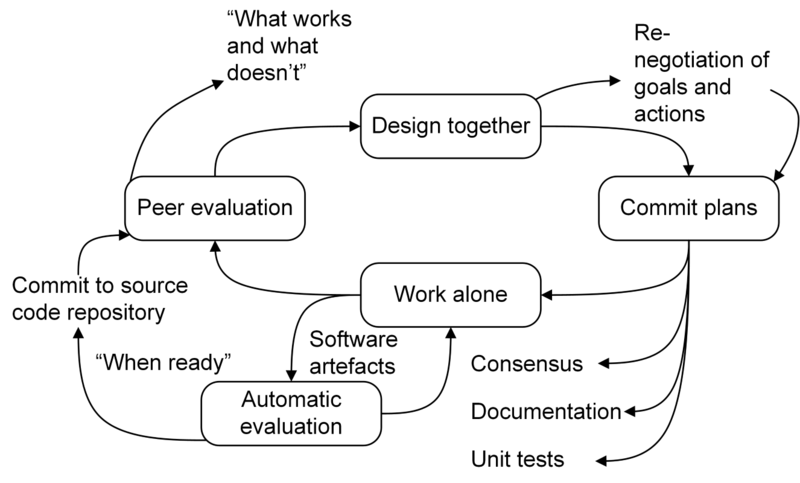 Our preliminary findings show that such groups are capable of setting up systematic software engineering processes that address software specification, development, validation, and evolution. While they were able to deliver software according to self-specified quality standards, the group has challenges in requirements specification, stakeholder engagement, and reorienting from development to product delivery. Software engineering methods and tools can effectively support the future of civic technologies and potentially improve their management, quality, and durability. We have expanded our work on adaptive, personalized gamification into a systematic process that can be applied in design situations. Our design process presents how to use algorithms to select the correct gamification approach for each situation during system runtime, saving effort-intensive design work. This paper presents both the design process, based on Deterding’s work on designing gamification (2015), and a demonstration using Marczewski’s player profiles (2015). An open access version of the paper is available at SpringerLink. The conference paper where we first demonstrated our work was discussed in a previous post. Personalization is an upcoming trend in gamification research, with several researchers proposing that gamified systems should take personal characteristics into account. However, creating good gamified designs is effort intensive as it is and tailoring system interactions to each user will only add to this workload. We propose machine learning algorithm -based personalized content selection to address a part of this problem and present a process for creating personalized designs that allows automating a part of the implementation. The process is based on Deterding’s 2015 framework for gameful design, the lens of intrinsic skill atoms, with additional steps for selecting a personalization strategy and algorithm creation. We then demonstrate the process by implementing personalized gamification for a computer-supported collaborative learning environment. 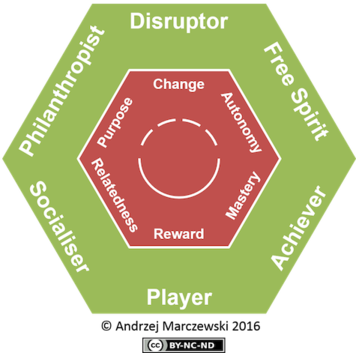 For this demonstration, we use the gamification user type hexad for personalization and the heuristics for effective design of gamification for overall design. The result of the applied design process is a context-aware, personalized gamification ruleset for collaborative environments. Lastly, we present a method for translating gamification rulesets to machine-readable classifier algorithm using the CN2 rule inducer. Knutas, A., van Roy, R., Hynninen, T., Granato, M., Kasurinen, J., & Ikonen, J. (2018). A process for designing algorithm-based personalized gamification. Multimedia Tools and Applications, 1-20. SpringerLink. Open access. Deterding, S. (2015). The Lens of Intrinsic Skill Atoms: A Method for Gameful Design. Human–Computer Interaction, 30(3–4), 294–335. I had the privilege to participate to the sustainability analysis of AI technologies with my colleagues Jayden, Birgit, and others. 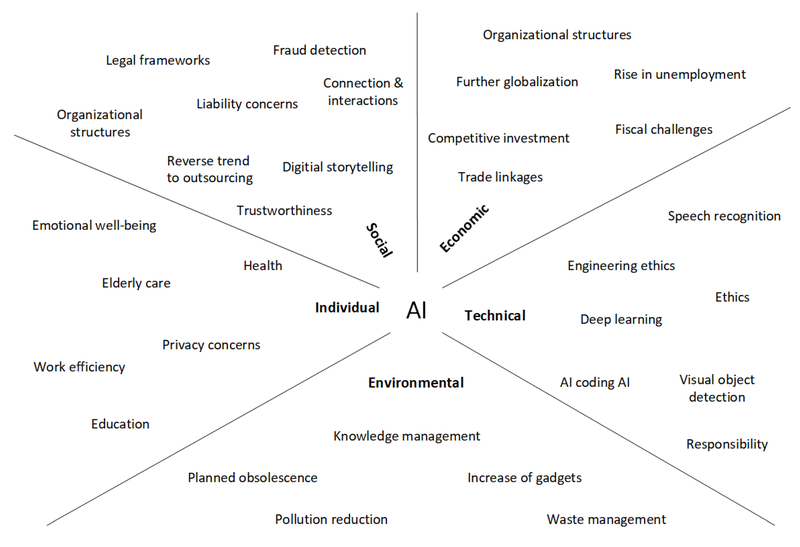 Recently we published a paper in the Technologies journal where we mapped the impact of AI on sustainability on five axis: Social, economical, technical, environmental, and individual. An open access version of the paper is available at MDPI. Since the 1950s, artificial intelligence (AI) has been a recurring topic in research. However, this field has only recently gained significant momentum because of the advances in technology and algorithms, along with new AI techniques such as machine learning methods for structured data, modern deep learning, and natural language processing for unstructured data. Although companies are eager to join the fray of this new AI trend and take advantage of its potential benefits, it is unclear what implications AI will have on society now and in the long term. Using the five dimensions of sustainability to structure the analysis, we explore the impacts of AI on several domains. We find that there is a significant impact on all five dimensions, with positive and negative impacts, and that value, collaboration, sharing responsibilities; ethics will play a vital role in any future sustainable development of AI in society. Our exploration provides a foundation for in-depth discussions and future research collaborations. Over the winter I had the privilege to participated in a pilot project initiated my colleague Palacin-Silva to investigate the impact of gamification on user engagement in environmental sensing. We used a participatory sensing approach where citizens actively participate in monitoring their environment. Participatory sensing can be said to be a type of civic technology in the sense that it empowers citizens to actively participate, instead of being passive recipients of environmental data. In this case the participants monitored the thickness of lake ice in Lappeenranta, Finland, where there was a pre-existing community. This community for example maintains their section of the Lake Wiki. In our approach, we created two applications for monitoring lake ice thickness, one with gamification and one without to specifically evaluate the impact of gamification. The gamified application had a statistically significant effect on user effectiveness, as measured by the number of interactions and new data inputted by the user compared to the time the application was open. Both groups found the application as usable and as satisfying to use. See more details about our recommendations in pg. 5 of the paper. The paper is available at the ACM Digital Library and a preprint is available for request at ResearchGate. In the upcoming, more advanced approach the civic engagement and civic technology aspects are deepened. In this upcoming SENSEI Project citizens are included in the co-design and co-creation. Again, all props to my colleague for initiating and leading the project. Participatory sensing (PS) and citizen science hold promises for a genuinely interactive and inclusive citizen engagement in meaningful and sustained collection of data about social and environmental phenomena. Yet the underlying motivations for public engagement in PS remain still unclear particularly regarding the role of gamification, for which HCI research findings are often inconclusive. This paper reports the findings of an experimental study specifically designed to further understand the effects of gamification on citizen engagement. 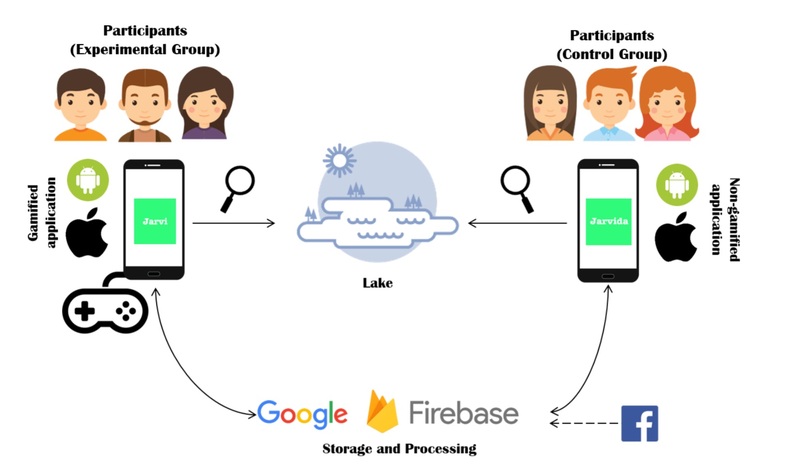 Our study involved the development and implementation of two versions (gamified and non-gamified) of a mobile application designed to capture lake ice coverage data in the sub-arctic region. Emerging findings indicate a statistically significant effect of gamification on participants’ engagement levels in PS. The motivation, approach and results of our study are outlined and implications of the findings for future PS design are reflected.